Few days back I went to an art exhibition of tribals from Madhya Pradesh. I was awestruck by the beauty and their style.
' The Gonds and Bhills are two of the several tribal communities of Central India, a region that covers most of the states of Madhya Pradesh, Chattisgarh and parts of Maharashtra. There is a vast amount of folk art among these tribes.' The Gondi or Gond people are a Dravidian people.The Gondi language is related to Telugu and other Dravidian languages. 'Painted Stories is what the tribal art form of the Pardhan Gond’s is popularly known as. Originally painted as symbols of good fortune on the walls of the Gond dwellings, this fabulous art-form has now found a uniquely contemporary expression.The Pardhan Gonds were the revered story tellers of the Gond Tribal community. To them was entrusted the vital task of passing down folk-lore and tribal stories, in the form of song and to the accompaniment of the stringed ‘Bana’.One of the distinctive elements is the use of ‘signature patterns’ that is used to ‘infill’ the larger forms on the canvas. 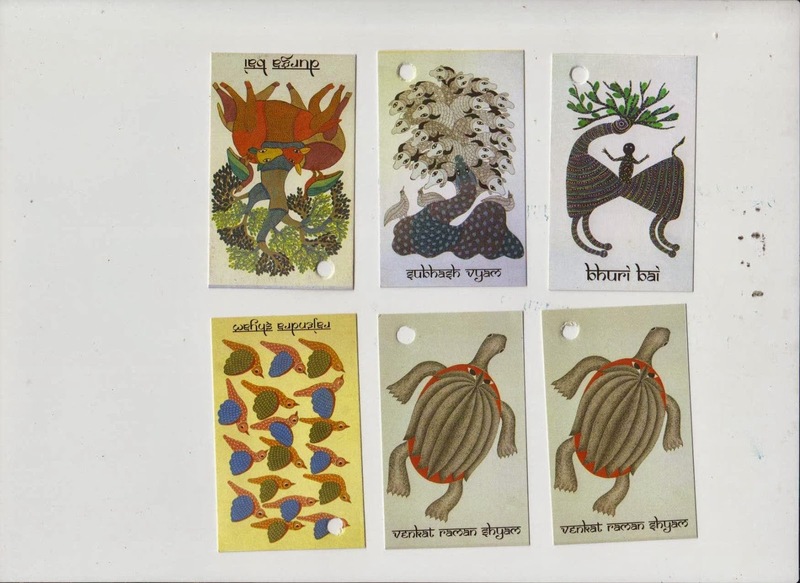 These infill patterns are distinctive identifying marks used by the Gond artists and every Pardhan Gond painter has developed his or her own signature style.Paper and canvas are the media of storytelling for the painters.They use limestone or charcoal as medium to make various decorative paintings. 'These images were originally painted on the walls and floors of their house and are called Digna and Bhittichitra (Bhitti= wall, Chitra = picture) paintings. Limestone or charcoal and other locally 'found' and naturally coloured substances were used to make various Digna or Bhittichitra paintings .' Gond art rendezvous with the belief that "viewing a good image begets good luck". This inherent belief led the Gonds to decorating their houses and the floors with traditional motifs. I particularly liked the style of Venkat and Rajendra Shyam. Pictures of Bhuri Bai was also on display. The organizers gave me a card of these artists.
' Bhuri Bai is a Bhil tribal artist, from Jhabua District of western Madhya Pradesh . Her near pointilistic style is so very similar to Australian Aboriginal Art ! Nice post about gond and bhil art paintings. Useful information and thanks for amazing share.